Christmas season hit full force this week. Monday night was our lighting parade for the neighborhood. We walk up and down the street as everyone turns their lights on for the first time and then we meet in someone's garage for hot chocolate and goodies. 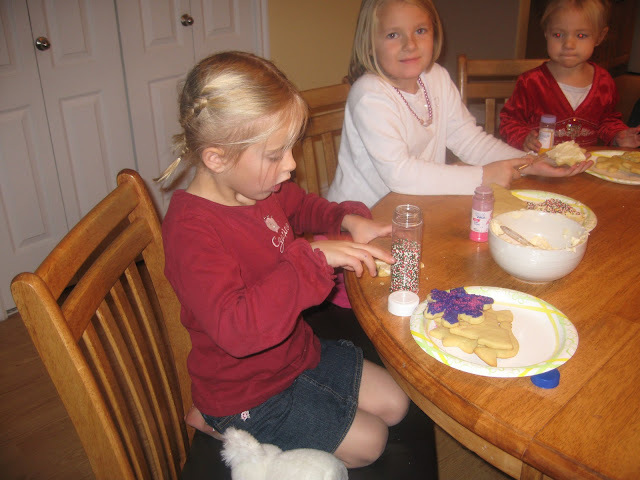 Wednesday we had our girls' cookie exchange party. We made tons of sugar cookies that the girls decorated while the moms talked. And then we ate a bunch of cookies and talked some more. Two things we learned this year that worked better. First have boxes to take cookies home in. They work so much better than towering plates spilling cookies everywhere. 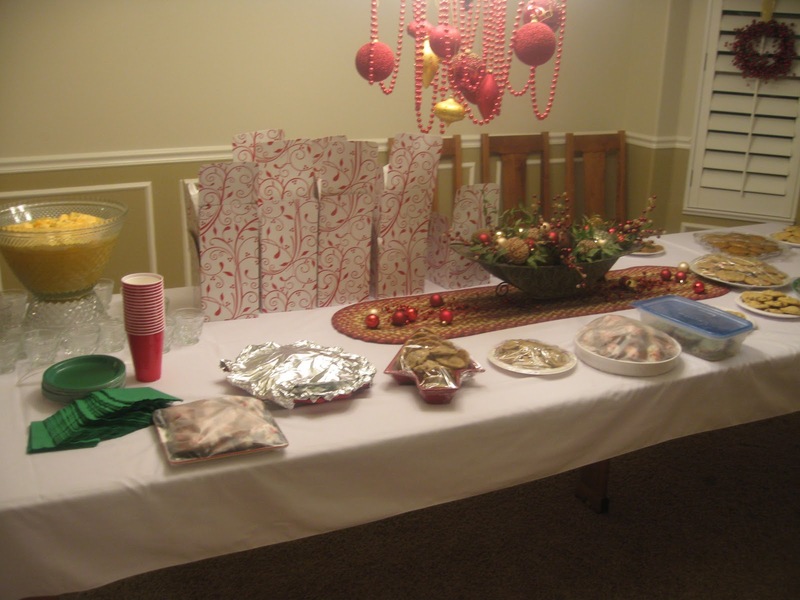 Second is to have the girls fill up the boxes with cookies for everyone to take home before we start munching on extras. That way everyone gets to take home some of everyone else's cookies. 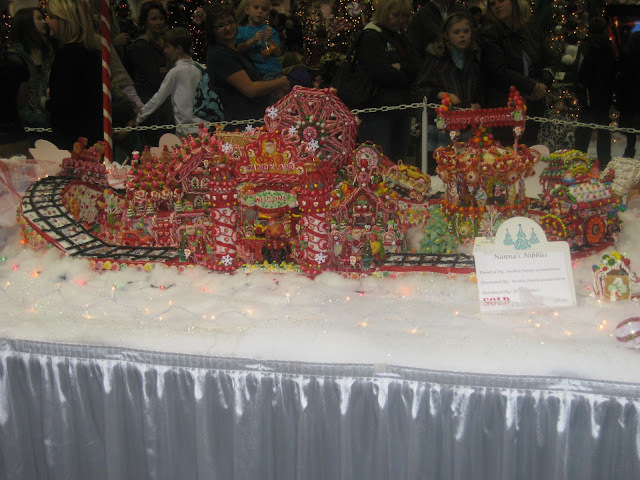 Friday the kids and I headed up to Sandy for the Festival of Trees. We walked around and saw all the decorated trees and gingerbread houses, ate scones and listed to some very earnest but bad kid singers perform. 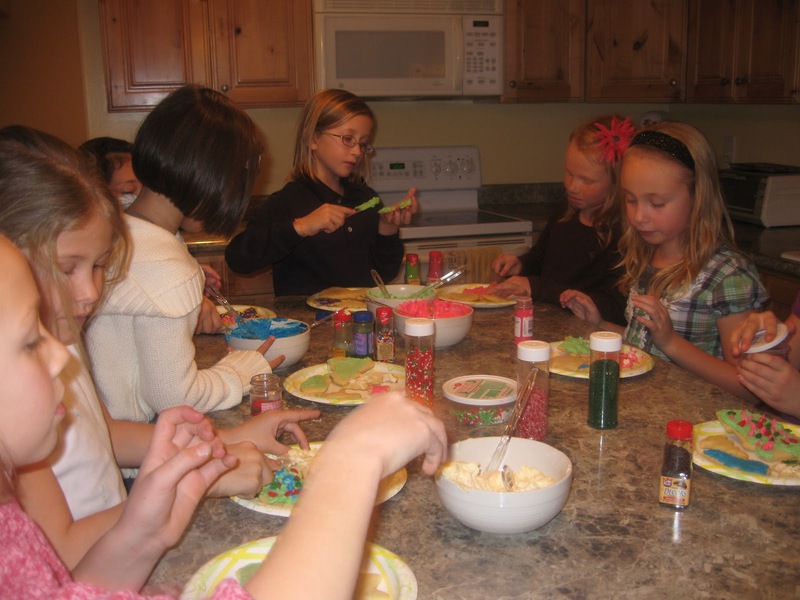 Saturday, Allison went to a cooking class with friends where the goal was to make as much sugar coated treats as possible. Then that night we went to our ward Christmas party. So this week has felt like the holidays. Kids have been excited over each event which has led to kids randomly and loudly singing Christmas songs, jumping up and down or bickering and teasing - depending on how much sugar had been recently consumed. Robyn caught a cold this week and so she and Spencer have been coughing away. Spencer's croup has come back but as long as he sleeps with his window open and clears his throat a bunch in the morning, its pretty livable. Robyn just sounds like a small smurfette, but her cough is almost gone. Taylor recovered from the stomach bug only to be hit with the cold bug. So he is busy blowing massive amounts of snot all over his blankets but is back to drinking again and is otherwise cheerful. Just if you hear a sneeze sound you grab a box of tissues and run to him fast. The cold has spread to me too but chloreseptic seems to keep me functioning. Its just that time of year. Jeremy has been busy this week. He is putting together a photo studio co-op where they partner up to rent a warehouse to be a photo studio. So he has had lots of meetings with that. Then he is also partnering up with some friends to produce and sell nail wraps. If you have ever seen patterned sticker type things covering my toe nails, that is what they are. They are calling themselves Sassy Nails and are planning to go live with that in a week or so. We got samples back last week and they looked really good. So he has been designing, figuring out marketing, building the web site etc. Add that to EQ stuff plus a few side jobs he has picked up recently and he has been pulling some late nights and waking up early with ideas. Seems like all his projects and plans came together right now. I have had little Christmas projects that have been keeping me busy plus just regular life. Moments of intense activity punctuated with long moments of monatany ie helping Spencer with math homework. The snow has finally almost melted but there are still clumps here and there. Allison was busy most of this week breaking out sleds and heading off in her snow gear to tackle any small hills. They just announced they are doing another school play this year, The King and I. She is excited to try out for it this week. 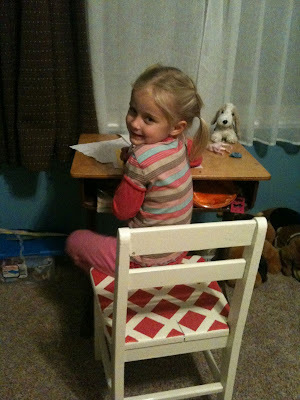 Mom, the bench cushion is done! 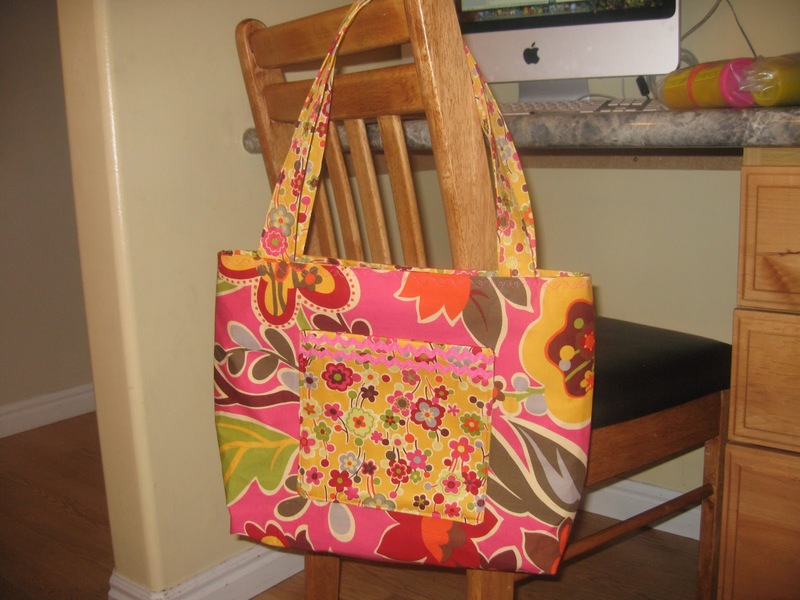 I sewed this bag this week that my friend taught at our Relief Society meeting. Now I know all the mistakes NOT to make, so I will have to do another one. 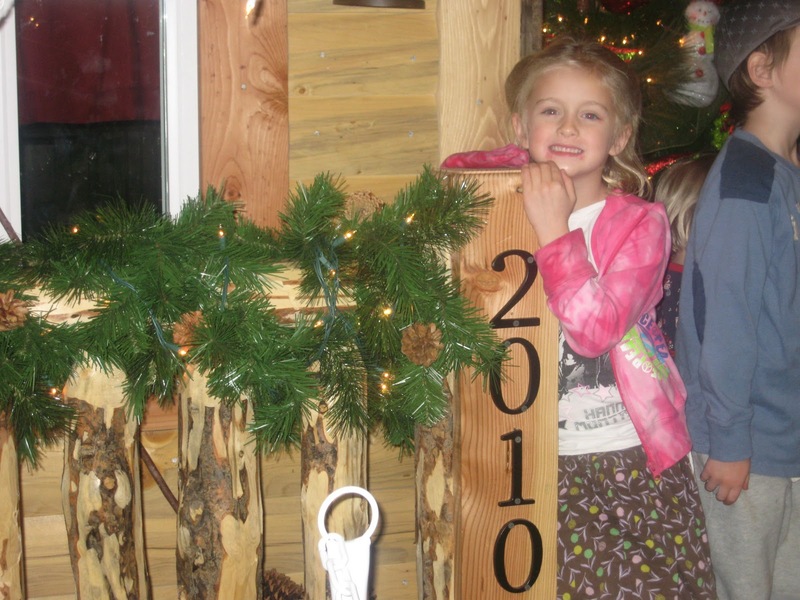 They had a playhouse at the festival that had a real gas fireplace inside.